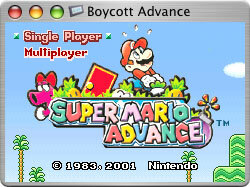 Support for the GBA DirectSound channels and Gameboy PSG. No support for classic Gameboy (use KiGB instead). C'est une version pour Mac. * Highly optimized CPU emulation that can attain full speed on all supported Macs. * Full support for all GBA video features, including scaling and rotation. * Partial support for the GBA DirectSound channels and Gameboy PSG.